everything LEB: No soup for you! I know its technically not fall yet, but here in New England we are having a particularly crisp day and I love it!! 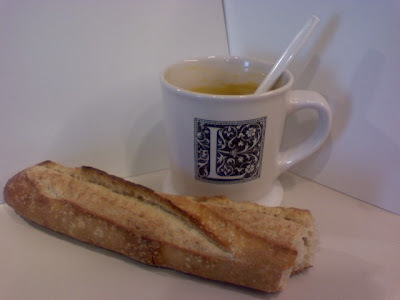 I was in a fall-ish mood when picking out lunch today at the grocery store and went with organic butternut squash soup and a baguette of crusty bread (no I did not eat the whole thing). It was de-lish!! Doesn't the soup look so pretty in my new "L" mug? It's part of the "pretty up my desk" kick I'm currently on. 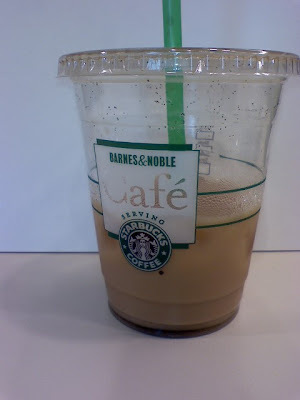 For dessert...iced coffee, 'nuff said. And yes, I did blog this while at work, but I swear I was on my lunch break at the time. wow your desk is coming along nicely! that cup is cute :) and i totally would have eaten the entire baguette. i'm so serious. Love that mug and love iced coffee. Actually this whole post makes me happy. Thanks Jessica, I love that mug too! !